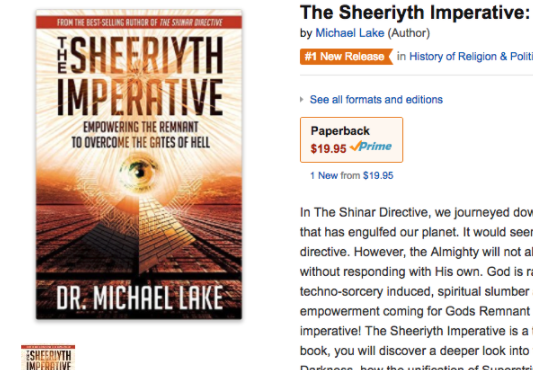 Excitement about the release of my new book, The Sheeriyth Imperative: Empowering the Remnant to Overcome the Gates of Hell, continues to grow. Preorders on Amazon have continued to accelerate, and now Amazon has designed the book as the #1 New Release today! We are hoping to have the book in stock at our ministry right before Thanksgiving. Do you know when Amazon will have it? Official release date is December 9. Unsurprising, considering the QUALITY of the man, and his wonderful wife Mary! This book should (AND WILL) be read in the WHITE HOUSE and Presidential ministerial halls around the globe. This is going to set back the beast system by many years. Praise be the YHWH! Yaaaaaaay! That is wonderful news and not one bit surprising! Mine has been ordered for a while and can’t wait to read it. Continued prayers for you, Mary and family. Thank you just doesn’t seem enough to express our appreciation for your work, courage, fight to tell people THE TRUTH and your prayers. We love y’all. I thank Yehovah for the many ways your ministry has blessed me and others. No worries these books are already charged with the holy spirit. Your insights into truth are outstanding reminder that The Most High is in control.